AP, Kingston Falls - Slain toddler Joseph Pertman was discovered yesterday in the Great Swamp Nature Preserve, where passing hunters noticed his body in an unlikely hiding spot. …Though Joseph, along with thirteen other children, had vanished over 5 months ago, his body was recovered in early stages of decay, suggesting he was alive until very recently, said Deputy Sheriff Jim Stolz. Stolz told the Associated Press that the body was found in a state of “bizarre contortion”, although the cause of death is pending investigation. Coroner Patricia Clark did not provide comment. 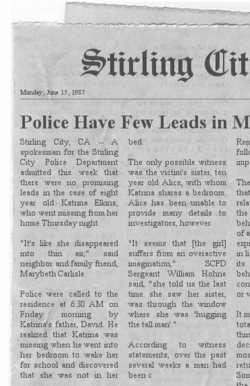 Stirling City, CA – A spokesman for the Stirling City Police Department admitted this week that there were no promising leads in the case of eight year old Katrina Elkins, who went missing from her home Thursday night. “It’s like she disappeared into thin air,” said neighbor and family friend, Marybeth Carlisle. Police were called to the residence at 6:30 AM on Friday morning by Katrina’s father, David. He realized that Katrina was missing when he went into her bedroom to wake her for school and discovered that she was not in her bed. The only possible witness was the victim’s sister, ten year old Alice, with whom Katrina shares a bedroom. Alice has been unable to provide many details to investigators, however. 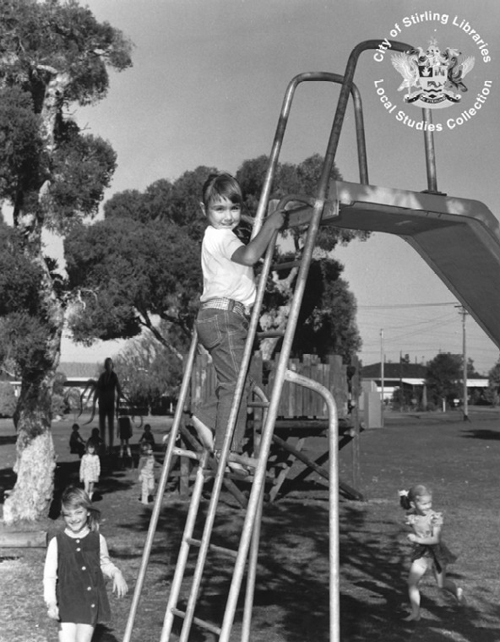 According to witness statements, over the past several weeks a man had been coming to the girls’ bedroom window at night, where he would tap on the glass, 'make faces’, and watch the girls. Police investigators initially dismissed the account as a dream, as the bedroom window is on the second story, with no support beneath it. 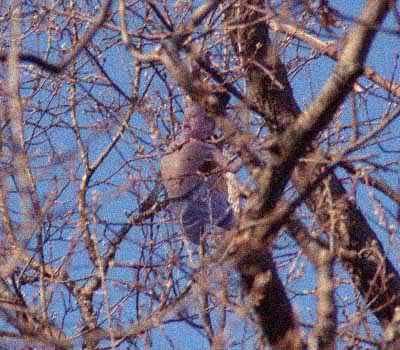 Police scoured the Elkins’ yard for clues, with no success. Police believe that there is no link between the disappearance and the vicious killing of the Elkins’ cat by disembowelment in April. Stirling City Post: Rash of Animal Mutilations Blamed on Coyotes. Stirling City, CA - A rash of pet deaths in northern Stirling City over the past several weeks has been blamed on coyotes, according to the Butte County Animal Control Department. “After a particularly harsh winter, food supplies may be low, forcing wild animals to venture into town in search of prey,” Animal Control Officer Joel Driscol said. As many as nine dogs and cats have gone missing since January and have been found in various states of decay. Many of the pets were disemboweled or otherwise seriously mutilated. JACKSON: Please state your name and age. PARKRINER: (sighs) Crystal Marie Parkriner, 16 years old… why aren’t you out there looking for Alice?! JACKSON: Ma’am, please calm down. We are looking for her; we just need to hear your story to maybe better help us find out what happened. What is your relationship to Miss Elkins? JACKSON: What were you and her doing in the park? PARKRINER: We were doing a late 16 birthday party… her parents flaked out on her since America’s Most Wanted ran that story about her sister again. PARKRINER: Yeah… couple years ago her sister was kidnapped… you know, Katrina Elkins. JACKSON: Was Alice upset or maybe suicidal? PARKRINER: She… she wouldn’t do that. JACKSON: Okay, tell me what happened. JACKSON: What things did you bring with you for this party? PARKRINER: We got there like 7 PM, so we were setting up the tent and stuff… Alice seemed okay. PARKRINER: No… she didn’t drink. She was looking at the lake for awhile… it was like 9 pm when Alice started acting strange. PARKRINER: She… got quiet. 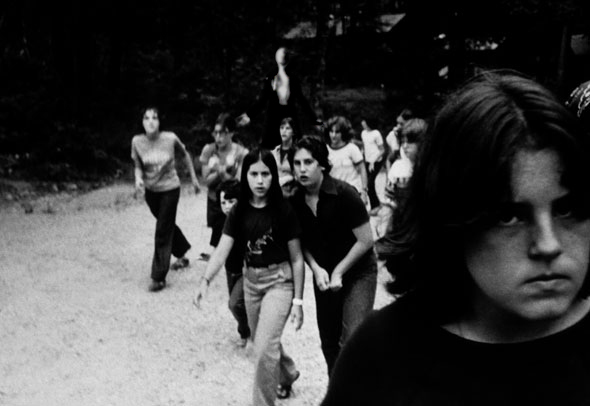 Kept looking out at the woods… then she started walking into the darkness. JACKSON: Did any of you follow her? 0300 Received word from police in [REDACTED] that a Type S phenomenon may be taking place, or have recently taken place, with 2 local children. Officers sent to the site have disappeared. Dispatching a unit. 0330 Confirmed 3 local men missing with possible dismemberment, Type S typical. 0430 Father and mother of 2 missing children (Cynthia, female, 6, and Jr, male, 3) are in interrogation. Names Damien and Melanie Falmouth. Damien Falmouth is having typical Type S reaction. Melanie Falmouth is mute. Full profiles and reports to follow in Appendix A. 0443 Type S fog found at the site, perimeter adjusted to ensure safety of all [REDACTED] unit members. 0454 D. Falmouth has disappeared from holding cell. No signs of forced entry or exit, typical of Type S. M. Falmouth has gouged eyes out with fingernails and remains mute. Extraction orders have been placed for M. Falmouth from local police to [REDACTED] institute. 0500 No further changes at site beyond constant expansion of perimeter. 0613 M. Falmouth has been successfully transported to [REDACTED] and admitted under Type S protocols. Highest security. Admittance papers attached can be found in Appendix B. Of note: Doctors surprised at her ocular wounds. They appear to be completely healed, with no tissue remaining. Full search of ambulance and cell provide no location of the missing tissue. Update from police station confirms that she was found bleeding, but there was no tissue found under any of her fingernails. Consistent with a Type S phenomenon. Currently M. Falmouth is under sedation and constant heavy observation in all forms. Remote retrieval team on standby near both site and the institution to retrieve all information in the event that all personnel are corrupted. 0756 Phenomenon sighted; shots fired before losing contact with alpha team of unit. Reinforcements dispatched. Perimeter of this event is largest of any previously recorded Type S phenomenon. 0804 Power outage at the [REDACTED] institute. M. Falmouth has disappeared and has been replaced with a young girl. Despite several backup sources of power, this event was not recorded in any way. All 3 monitors of M. Falmouth’s cell have been placed in quarantine under observation. 0835 Young girl positively identified as Katrina Elkins, age 8, victim 23 of 1987. See Appendix B for all case files related to Katrina Elkins and her current status. Note: She appears to still be 8 years old and healthy, with no obvious wounds. 0848 Examining physician discovered a long scar across Elkins’ abdomen, from her mons to her sternum. The physician, Dr. E███, indicated that the scar was barely healed and that her belly was slightly distended. The doctor stated that her internal organs appeared and felt as if they were writhing. Upon further inspection, they did not appear to be internal organs at all. This information has been withheld from the child and she still appears to be in good spirits. She asks after her mother and father and sister. Orders have been given to examine her as quickly as possible and to quarantine everyone with whom she had come in contact. 0900 Perimeter has stopped expanding, and fog appears to be dissipating. At 0930, teams will proceed inward toward the site. 0926 Information transmission to remote retrieval unit was temporarily interrupted, but resumed without incident. 0928 Transmission has been contaminated. Dr. E███ and his unit have been completely compromised and the [REDACTED] institute does not respond to all communication. Retrieval team continues to receive the transmission of the EKG and ultrasound that was being performed on K. Elkins. 0930 Unit moving inward toward site. 0934 Transmissions have gone dead, but not before we got some very interesting readings. Please see Appendix C for readings, as we believe these readings do not belong to K. Elkins. 1000 Unit reports that the site has only police officers, disemboweled in standard Type S fashion. All evidence has been gathered and is ready for transport. 1015 Local police have been informed of the status of their officers and that the site is now clean. Site will be revisited. 1030 Retrieval unit found [REDACTED] institute empty of all human life. All 308 workers at the [REDACTED] institute have disappeared. We can only assume the site has been contaminated. On the doorstep, the team found one left hand and the fifth digit from another hand. 1043 Fingerprinting and staff records confirm that both hand and digit belonged to Dr. E███. The severed ends appear to be healed over. 1100 No changes. Retrieval unit continues to search the [REDACTED] institute. 1500 The pipes in [REDACTED] institute appear to have been frozen. They are currently thawing. 1534 Further inspection of the frozen pipes indicates they are full of a mixture of both ice and frozen blood. Specimens are being taken for DNA identification against both staff and victim records. 1700 No changes. Search complete; no other anomalies found in the [REDACTED] institute. Equipment appears to be intact and will be moved to [REDACTED]. A man was found wandering behind a supermarket. Police fingerprinting confirmed this man as Dr. E███. A unit was dispatched but no Type S phenomenon indicators occurred. The team escorted Dr. E███ to [REDACTED]. He did not respond to questioning. In his pockets was found a receipt dated Jan 4 2004 at 0834 from [REDACTED] (see Appendix D for items and analysis). Note: We assume this is from a faulty cash register but we are planning a team at this time and date regardless. He has been quarantined and will be studied. We have never retrieved a human being alive. Despite his clear mental incapacity, his body must turn up some clues. Despite all testing, Dr. E███ appears completely normal and healthy. He has gone completely mute besides muttering in an unknown language. We have sent samples of these mumblings to linguistic experts. No one has been able to identify the language. Of note is his giggle, which sounds remarkably typical of S.
At 0834 Dr. E███ died of severe internal hemorrhaging. The cause of this is unknown. The autopsy showed that there was a finger belonging to K. Elkins next to his appendix. The finger appeared to be healed over at the severed end, and proved to have a pulse for a few minutes after removal from the body. It did not respond to stimulus. Why we did not see this finger in the daily tests cannot be known. No event occurred at the site indicated in the receipt.